Saddle up cowboy! You'll be ready to ride in no time once you slip into the Chippewa Men's 29300 USA-Made 12 Inch Brown Leather Slip-On Vibram Cowboy Boots. This rugged pair of Chippewa boots is ready for the range and the rodeo, and the men's boots are loaded with ... (see full details) (see specifications) #CHP29300. Saddle up cowboy! You'll be ready to ride in no time once you slip into the Chippewa Men's 29300 USA-Made 12 Inch Brown Leather Slip-On Vibram Cowboy Boots. This rugged pair of Chippewa boots is ready for the range and the rodeo, and the men's boots are loaded with rough and tough features to make your day a little easier on your feet. Handcrafted in the USA, these 12-inch brown boots feature brown bay crazy horse leather uppers for the heavy-duty durability you need for rugged conditions. Pull-on straps allow easy on and off action for a simple fit. Chippewa employs Goodyear leather Welt construction in crafting this pair of American-made boots, which means the rugged soles are stitched, not glued, to the durable uppers to give you long-lasting, repairable wear. The Vibram Nitrile Yellow Plug outsoles provide superior oil- and slip-resistance for reliable traction on a variety of terrains. The strong midsoles are developed using a 4 iron rubber/6 iron robus combination. What better way to celebrate your gratefulness for all this support than by hollering, "Yippee ki yay!" You'll find these slip-resistant boots lined with leather for supple all-day comfort that aids in maintaining the slip-on boots' shape. The cushioned Texon insoles will soften your step for easy wear and increased support, and the triple-ribbed steel shanks help support your arches even more. Slip on some comfort and saddle up with style. Pick up your Chippewa Men's 29300 USA-Made 12 Inch Brown Slip-On Cowboy Leather Boots today for the rugged performance you need on the open range. Good heavy duty boot. Runs large compared to Justin ropers. Recommend ordering at least a half size down. These are the most comfortable boots I have ever worn. I have had mine for 2yrs, they are worn out, but have had alot of miles and a very hard life. I am looking to buy the exact same boot to replace them. These seem to run a half size too big. Take a long time to break in but quality is great. These boots are great! Took a little while for them to break in but that's expected in a good boot. Only thing though is that these run a half size too big. These boots are very comfortable and rugged. As others have said, they seem to run about a 1/2-size large, but not a problem to add a gel insole for added comfort and take up the extra room. I like to wear cowboy boots while riding my Harley, but most cowboy boots have a slick leather sole -- not good for oil-slicked asphalt! 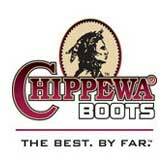 These Chippewa boots have a Vibram 430 minilug sole which provides excellent traction. Several guys in my riding club asked about the boots and subsequently bought themselves a pair. These boots are also water-resistant. I got caught in cloudbursts while wearing them, and my feet remained dry, even when the boots were swept with rivers of water from roadspray. I highly recommend these rugged, hard-working boots! Chippewa Boots: Men's USA-Made Slip-On 29300 Brown Cowboy Work Boots is being added to your cart.